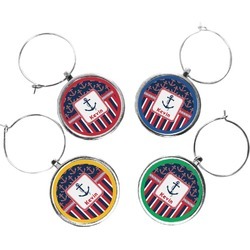 This nautical design features anchor pattern on top and stripes on the bottom. 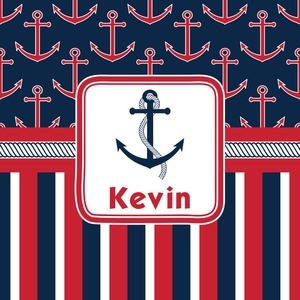 We chose to use the classic navy, red and white colors for our design. We chose the ribbon with rope, along with a squarish frame that contains a graphic and text. We use the anchor with rope for our graphic and a name for our text / personalization. This design can be customized to your liking. The colors can be changed easily. We have many other anchors and nautical graphics in our system, as well as other nautical pattern for you to choose from.